Two late goals inside the last 10 minutes from Olivier Giroud and Aaron Ramsey were enough to grab Arsenal a point against Everton at Goodison Park. The fans were ready, and the players were ready. The referee blew the whistle and Everton kicked off this highly anticipated clash at Goodison Park. Just 10 minutes into the game, Roberto Martinez was forced to take Steven Pienaar off due to an injury, and bring the experienced Englishman, Leon Osman on. An early chance for Arsenal went begging, as Seamus Coleman's attempted clearance found Alex Oxlade-Chamberlain on the edge of the penalty box but the youngster placed his shot just wide of Tim Howard's goal. After Mesut Ozil failed to track Seamus Coleman lurking in the penalty box, the Irishman punished him with a bullet header that fired past Szcezny in goal for the Gunners. Stunning finish from a terrific right back. A few minutes after Coleman's goal, Everton had a glorious chance due to slack defending from Arsenal. New signing Chambers let Kevin Mirallas on goal but the Belgian scuffed his shot wide. The Toffees were having promising spells moving forward on the ball, with the pace of Mirallas making Arsene Wenger's back line constantly work and track through the middle and down the flanks. With the strength and pace of Romelu Lukaku, Arsenal were in trouble when the youngster clipped the ball around Per Mertesacker and caught the Gunners on the counter. He cut in on his strong left foot, then put Steven Naismith through on goal and the Scotsman fired past Wojceich Szcezny to put The Toffees 2-0 up at half time. The second half burst into life as both sides were pouring forward. Olivier Giroud had his effort saved and at the other end, Leighton Baines sprinted up field, past Arsenal defenders into the box but his lay off back into the centre resulted in a foul against Everton. Arsenal had a glimmer of hope as the Arsenal substitute Santi Cazorla fired in a low cross and Aaron Ramsey slotted home past Tim Howard to restore The Gunners' hope. Late drama was in store as Olivier Giroud headed in from a perfectly executed cross to put frowns on the face of Everton fans. Two late goals were enough to grab Arsenal a point after being 2-0 behind at half time! Everton were tiring and Wenger's men capitalized. 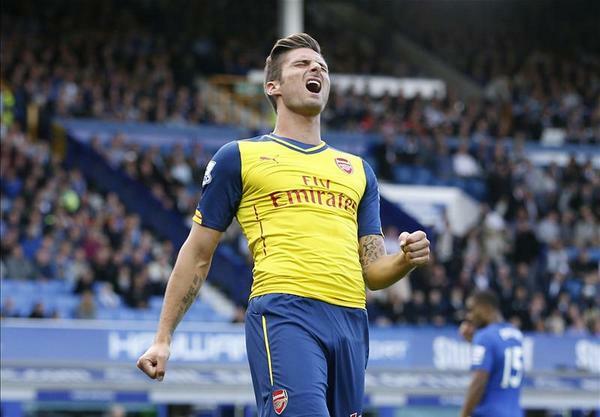 Seamus Coleman and Steven Naismith's first half goals were cancelled out by Oliver Giroud's 9th minute equalizer.